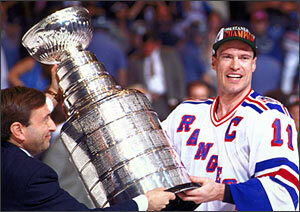 The 1994 Stanley Cup Final was a best-of-seven playoff series contested between the Eastern Conference champion New York Rangers and Western Conference champion Vancouver Canucks of the National Hockey League. The Canucks were making the club’s second Final appearance, their first coming during their Cinderella run of 1982, and the Rangers were making their tenth appearance, their first since 1979. The Rangers ended their record 54-year championship drought with a victory in game seven to claim the long-awaited Stanley Cup. It was the fourth championship in franchise history. The CBC broadcast of the deciding game seven attracted an average Canadian audience of 4.957 million viewers, making it the most watched CBC Sports program in history to that time.